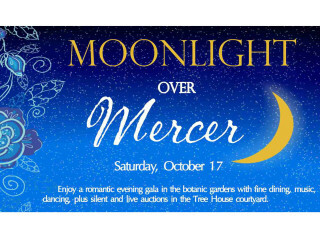 Spend a marvelous autumn evening in the botanical gardens while supporting Mercer during Moonlight Over Mercer: Dine, Dance and Donate. While under the canopy of stars, enjoy savory appetizers, a gourmet cocktail buffet and complimentary wine and beer as the DJ Brothers entertain. Plus, you can peruse the silent and live auction items to find some unique and extraordinary treasures to take home. Proceeds benefit the many special garden projects and programs at Mercer. $75 per person, advance reservations required.